Embroidery is a great way to get your company logo or slogan on wearable merchandise. It is is affordable and easy way to get your brand out there. Whether you need employee shirts to baseball caps Digital Embroidery is your one stop shop for anything embriodered. 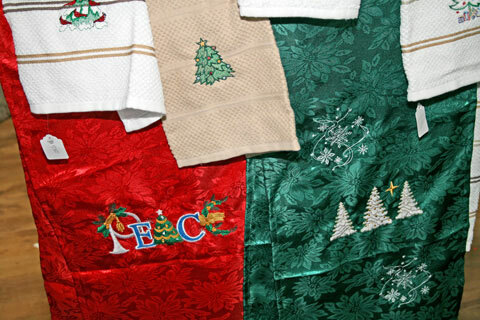 When it come sto embroidery you should consider your color choices wisely. It is best to have limited color and a bold design. The design can vary but should depend on what it is being embroidered on. Digitizing is both a technical and a creative process. It's much more than most people might imagine. While the digitizer may begin with a scan or a graphic file, he has to tell the embroidery machine where to put each stitch, and what order to sew your design - including where to stop, trim the threads, and switch to a different color. Poor digitization can lead to a poor-looking design, or one that is very hard to sew. We're sure you'll be very pleased with the results. Great place to get all your t-shirts designed at. Very friendly people with fantastic turn around time.